Mitosis is critical to every living organism and defects often lead to cancer and developmental disorders. Using this imaging protocol and zebrafish as a model system, researchers can visualize mitosis in a live vertebrate organism and the multitude of defects that arise when mitotic processes are defective. Percival, S. M., Parant, J. M. Observing Mitotic Division and Dynamics in a Live Zebrafish Embryo. J. Vis. Exp. (113), e54218, doi:10.3791/54218 (2016). Mitosis is critical for organismal growth and differentiation. The process is highly dynamic and requires ordered events to accomplish proper chromatin condensation, microtubule-kinetochore attachment, chromosome segregation, and cytokinesis in a small time frame. Errors in the delicate process can result in human disease, including birth defects and cancer. Traditional approaches investigating human mitotic disease states often rely on cell culture systems, which lack the natural physiology and developmental/tissue-specific context advantageous when studying human disease. This protocol overcomes many obstacles by providing a way to visualize, with high resolution, chromosome dynamics in a vertebrate system, the zebrafish. This protocol will detail an approach that can be used to obtain dynamic images of dividing cells, which include: in vitro transcription, zebrafish breeding/collecting, embryo embedding, and time-lapse imaging. Optimization and modifications of this protocol are also explored. Using H2A.F/Z-EGFP (labels chromatin) and mCherry-CAAX (labels cell membrane) mRNA-injected embryos, mitosis in AB wild-type, auroraBhi1045, and esco2hi2865 mutant zebrafish is visualized. High resolution live imaging in zebrafish allows one to observe multiple mitoses to statistically quantify mitotic defects and timing of mitotic progression. In addition, observation of qualitative aspects that define improper mitotic processes (i.e., congression defects, missegregation of chromosomes, etc.) and improper chromosomal outcomes (i.e., aneuploidy, polyploidy, micronuclei, etc.) are observed. This assay can be applied to the observation of tissue differentiation/development and is amenable to the use of mutant zebrafish and pharmacological agents. Visualization of how defects in mitosis lead to cancer and developmental disorders will greatly enhance understanding of the pathogenesis of disease. Mitosis is a critical cellular process essential for growth, differentiation, and regeneration in a living organism. Upon accurate preparation and replication of DNA in interphase, the cell is primed to divide. The first phase of mitosis, prophase, is initiated by activation of cyclin B/Cdk1. Prophase is characterized by condensation of chromatin material into chromosomes. Nuclear envelope breakdown occurs at the transition between prophase and prometaphase. In prometaphase, centrosomes, the nucleating center for spindle formation, begin to migrate to opposite poles while extending microtubules in search of kinetochore attachment. Upon attachment, conversions to end-on microtubule attachment and tension forces orient the chromosomes forming a metaphase plate1. If all chromosomes are attached correctly, the spindle assembly checkpoint is satisfied, cohesin rings holding the sister chromatids together are cleaved, and microtubules shorten to pull sister chromatids to opposite poles during anaphase2,3. The final phase, telophase, involves elongation of the cell and reformation of the nuclear envelope around the two new nuclei. Cytokinesis completes the division process by separating the cytoplasm of the two new daughter cells4-6. Alteration of key mitotic pathways (i.e., spindle assembly checkpoint, centrosome duplication, sister chromatid cohesion, etc.) can result in metaphase arrest, missegregation of chromosomes, and genomic instability7-10. Ultimately, defects in pathways controlling mitosis can cause developmental disorders and cancer, necessitating visualization of mitosis and its defects in a live, vertebrate, multi-cellular organism10-16. Zebrafish embryos serve as a great model organism for live imaging due to the transparent tissue, ease of microinjection, and fast development. Using zebrafish, the overall goal of this manuscript is to describe a method of live 5D (dimensions X, Y, Z, time, and wavelength) imaging of mitosis17 (Figure 1C). The use of mutant zebrafish defective in different mitotic pathways demonstrate the consequence of such defects. For this protocol, Aurora B and Esco2 mutants were chosen to illustrate these defects. Aurora B is a kinase that is part of the chromosome passenger complex (CPC) involved in spindle formation and microtubule attachment. It is also required for cleavage furrow formation in cytokinesis18,19. In zebrafish, Aurora B deficiency leads to defects in furrow induction, cytokinesis, and chromosome segregation20. Esco2, on the other hand, is an acetyltransferase that is essential for sister chromatid cohesion21,22. It acetylates cohesin on the SMC3 portion of the ring thus stabilizing cohesin to ensure proper chromosome segregation at the metaphase-anaphase transition23. Loss of Esco2 in zebrafish leads to chromosome missegregation, premature sister chromatid separation, genomic instability, and p53-dependent and independent apoptosis24,25. Due to the availability, auroraBhi1045, and esco2hi2865 mutant zebrafish (hereafter referred to as aurBm/m and esco2m/m, respectively) will be used to illustrate this technique25-27. Coupling confocal microscopy with fluorescent-tagged cell machinery has enabled researchers to visualize chromatin and cell membrane dynamics during mitosis25,28,29. 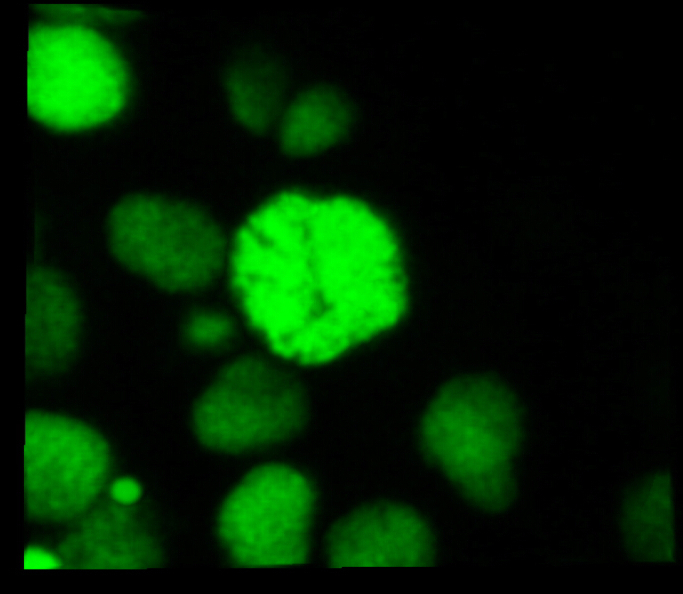 Fluorescent-tagged histones have historically been used to visualize chromatin. Histones are nuclear proteins composed of four different pairs (H2A, H2B, H3, and H4) that are responsible for the nucleosome structure that composes chromosomes30. 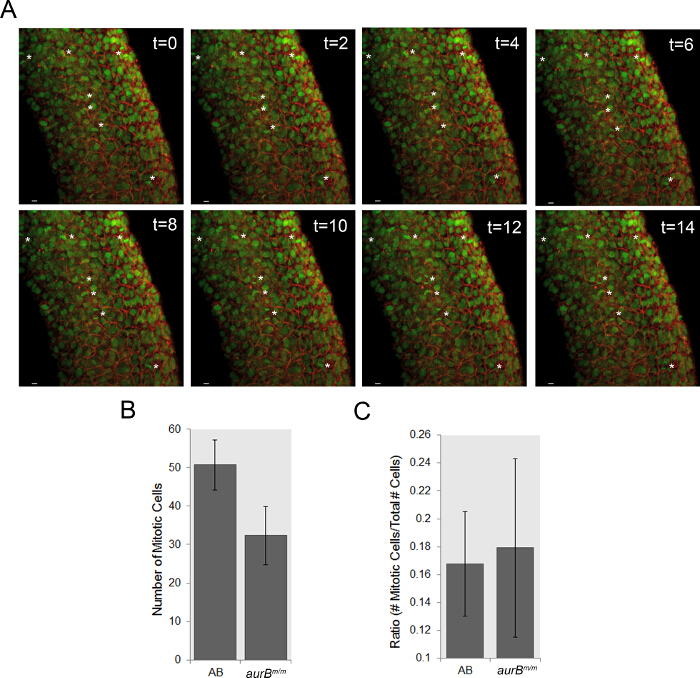 While H2B is arguably the most used histone for fluorescent proteins in mouse and cell culture, use of Histone 2A, Family Z (H2A.F/Z) has proved well for use in zebrafish31,32. Concanavalin A and casein kinase 1-gamma for example, localize to the cell membrane and have previously been shown effective in visualizing the cell membrane in sea urchins and drosophila33,34. Other studies have shown that the CAAX fluorescent-tagged protein labels the cell membrane and was successful in zebrafish31. CAAX is a motif that is recognized by post-translational modifying enzymes such as farnesyltransferases and geranylgeranyltransferases. Modifications by these enzymes cause proteins to become membrane-associated, thus labeling the cell membrane35. Due to the prior use in zebrafish, this protocol chose to use H2A.F/Z and CAAX to label chromatin and the cell membrane. Application of this method will allow the researcher to monitor mitosis at the individual cell level to observe individual chromosome dynamics, as well as simultaneously monitor multiple cell divisions that may impact tissue differentiation and development. This article will focus on imaging the dynamics of chromosome segregation during mitosis at the individual cell level. Within this manuscript, the ability to observe several mitotic divisions, calculate division time, and decipher the mitotic phenotypes will be illustrated and discussed. By using these parameters, physiologically relevant data can be collected and applied to several disease states affected by mitotic defects. Linearize pCS2-H2A.F/Z-EGFP and/or pCS2-mCherry-CAAX vectors by NotI restriction enzyme digest31. Using an RNA in vitro transcription kit, generate 5' capped mRNA products from each template, according to manufacturer's protocol. Purify the capped mRNA using a purification kit. Follow manufacturer's instructions. Elute with RNase-free H2O. Determine the concentration of RNA by absorbance at 260 nm using a spectrophotometer. (OD260 x dilution x 40 µg/ml). Dilute the RNA to 100 ng/µl for each H2A.F/Z-EGFP and mCherry-CAAX with RNase-free H2O. If the RNA concentration is too low, the fluorescence will be diminished or absent. Brighter samples will diminish the concerns over phototoxicity and photobleaching. On the other hand, too much RNA can be toxic and/or cause off target effects. Note: Store the remaining purified mRNA in -80 °C freezer. Assemble breeding tanks with a barrier to separate the tank into two regions and fill each breeding tank with aquaculture system water used in the zebrafish facility. In order to prevent untimely breeding, place two male fish on one side of the barrier and two female fish on the other side the night before breeding. The next day, thaw the previously prepared mRNA mixture on ice. Replace the water in breeding tanks with fresh aquaculture system water and remove the barriers. 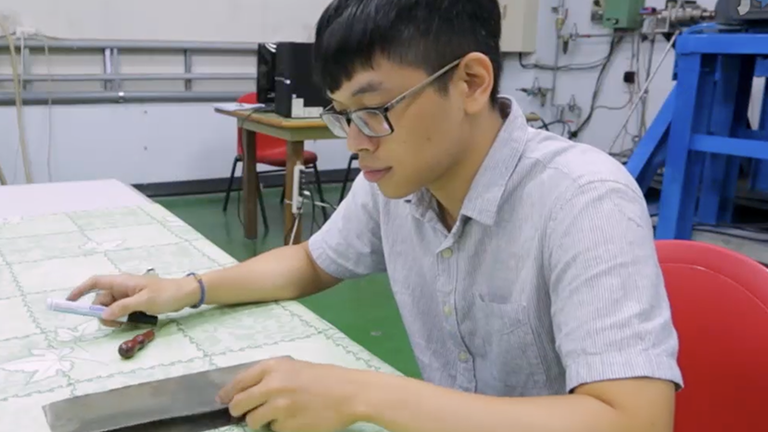 Immediately after the barriers are pulled, warm an injection mold to 28.5 °C and set up the equipment for microinjection. Note: For information on injection molds, please refer to Gerlach36. Collect eggs every 10 - 15 min using a tea strainer and rinse the eggs into a clean 100 x 15 mm Petri dish with E3 Blue (5 mM NaCl, 0.17 mM KCl, 0.33 mM CaCl2, 0.33 mM MgSO4, 10-5% Methylene blue). E3 Blue is used to prevent fungal growth and ensure proper development of larval fish. For more information on mating and embryo collection, refer to Gerlach36 and Porazinkski37. Embed one-cell staged embryos in a warmed injection mold and inject the RNA into the yolk in the desired amount of embryos (Figure 1A). Account for natural embryonic death and unfertilized embryos by performing embryonic injections on 15% more embryos than needed for the experiment. For additional details on microinjection of zebrafish embryos, please refer to Gerlach36 and Porazinkski37. NOTE: For first time use of mRNA, perform a dose-curve analysis to determine the optimal dose for fluorescence and viability (defined as no gross developmental defects up to 5 dpf) prior to performing 5D imaging. 150 - 200 ng/µl injected into embryos is often the optimal concentration, therefore it is a good starting point for the final concentration. Carefully extract the injected embryos from the mold using a modified 9" glass Pasteur pipette. To modify the pipette, melt the end using a Bunsen burner until it forms a ball. Place injected embryos in a 100 x 15 mm Petri dish in E3 Blue and house in a 28.5 °C incubator. Six hr post-injection, remove any dead or unfertilized embryos from the plates and add clean E3 Blue. House the embryos at 28.5 °C. Two hr before imaging, screen the injected embryos for GFP using a fluorescent dissecting microscope. Place bright green GFP-expressing embryos in a new 100 x 15 mm Petri dish with E3 Blue. Boil a stock solution of 1% low melt agarose by adding 1 g of low melt agarose to 100 ml of E3 Blue. After using the agarose, cover the flask with aluminum foil. The stock solution remains useful for up to one month. Aliquot 3 ml of the melted agar into a 17 x 100 mm culture tube. Keep the agarose warm by placing the culture tube in a 42 °C water bath until ready for use. Prepare a 15 mM Tricaine solution in deionized water to anesthetize the zebrafish embryos36. NOTE: If imaging at earlier time points is desired, the concentration of agar can be decreased as low as 0.3%39. Bring the 15 mM Tricaine, screened embryos, low melt agarose, E3 Blue, and a 35 mm glass coverslip bottom culture dish to a dissection light microscope. Carefully remove the embryo's chorion with #5 tweezers. Do this for three embryos. Place the dechorionated embryos in a separate container to be anesthetized. The lid of the coverslip bottom dish is often used for this purpose. Using a transfer pipette, add three drops (approximately 150 µl) of 15 mM Tricaine to the dish of 5 ml E3 blue (if using the lid of the coverslip bottom dish) or until embryos have been sufficiently anesthetized. In addition, add 3-4 drops (approximately 150 - 200 µl) of 15 mM Tricaine solution to the 1% melted agarose tube. Using a p200 pipette with 1 cm of the pipette tip cut off; transfer the anesthetized embryos to the coverslip-bottomed dish. Remove any excess E3 Blue:Tricaine solution. Slowly add 5 - 10 µl of low-melt agarose:Tricaine solution over the embryos, keeping each drop separate to ensure the embryos do not accidentally drift close to one another. Warning: If the agarose is too warm, it will damage the embryo. A good temperature to maintain the agar at is 42 °C. Using a 21 G 1 ½ needle, gently orient the embryo in the agarose to the desired position. When using an inverted microscope for time-lapse imaging, orient the region of interest (ROI) as close to the coverslip as possible. Note: For general purposes, the tail region offers ease of orientation and clarity due to the relatively thin tissue (Figure 1A). Other tissues, such as the epithelial layer surrounding the yolk and fin folds, can be used28,29. These tissues offer great clarity, however these regions are only a few cell layers thick. For the purpose of this protocol, it is beneficial to image the tail region to acquire as many cell divisions as possible. Allow a few min for partial solidification of the agar. Use the needle to break apart a small piece of agar to test its solidification. When a piece of agar can be pulled away from the drop, proceed to the next step. Cover the entire coverslip with low melt agar forming a dome over the embedded embryos. Allow the agar to solidify before moving the dish for confocal imaging (Figure 1A). During the agar solidification process (takes approximately 10 min), prepare 3 ml of E3 Blue solution with five drops of (approximately 250 µl) 15 mM Tricaine to be placed over the embedded embryos during imaging. NOTE: See Ariga40 and O'Brien41 for details on how to perform 5D imaging using other confocal systems. For Z-interval, Z-stack, Z-depth, time interval, and 5D definitions see Figure 1C. Open the imaging software and set the microscope to 60X NA 1.4 objective lens. Apply immersion oil to the objective lens and place the culture dish in the slide holder on the microscope stage. Using the axis controller, center the embryo of interest above the objective lens and bring the objective lens upward to meet the culture dish. 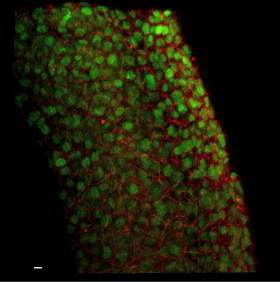 Click on the eye piece icon and switch to the GFP filter on the microscope. Focus on the ROI. Focusing on the tissue closest to the coverslip will offer the best imaging results. Remove the interlock. Select the GFP and mCherry channels (pre-set wavelengths in software) and set the line averaging option to normal. Use "View/Acquisition Controls/A1 Scan Area" command to open the A1 Scan Area tool. Begin scanning. Using the axis-controller, position the embryo so that the scan area is filled with as much of the zebrafish as possible. The laser power does not need to be optimal at this point. Lower the laser power to avoid unnecessary photobleaching. Use the "View/Acquisition Controls/ND acquisition" command to open the ND acquisition control panel. Begin scanning to set the Z-stack parameters. Set the Z-stack upper limit to where the cells are not in focus and lower limit to where cells are no longer visible. Allow for a 3 µm space above the sample for growth and cell movement, which may expand into the imaging field. The Z-stack for the figures shown in this protocol covered a Z-depth of 40 µm in the embryo tail. Set the Z-interval step size to 2 µm. On average, a cell is 10 µm in diameter; therefore 2 µm will produce five intervals of imaging data to be analyzed for each cell. NOTE: The depth of the image that can be acquired depends on the Z interval. Z resolution is sacrificed to gain overall depth in the Z dimension in order to image as many cells undergoing mitosis as possible (large Z-depth). The inverse is true, in that, by decreasing the step size, Z resolution is gained, while Z depth is sacrificed (small Z-depth). Adjust the image laser power, HV, and offset levels. For the experiments demonstrated in this protocol, use the following laser power, HV, and offset levels set at the corresponding levels, respectively, for the GFP channel; 2 - 5, 120 - 140, and -9 to -11. For the mCherry channel, use the following laser power, HV, and offset levels, respectively; 3 - 6, 120 - 140, and -3 to -8. Once the parameters are set, shut off the scan to prevent unnecessary laser exposure that may cause phototoxicity and photobleaching of the sample. Select the 2x line averaging icon. "No averaging" produces a grainy image while "4x line averaging" drastically increases the scan time. Use of 2x line averaging provides the best image quality and fastest scan time. Select the appropriate time interval and time duration necessary for the experiment. For wild-type divisions, two-minute time intervals for 2 hr is best for determining mitotic duration (used in Figures 1, 2, 3A, and 3B). Divisions that activate the spindle assembly checkpoint for longer than 30 min are more suitable for five minute intervals for four hr in order to preserve fluorescence as demonstrated in Figure 3C. Check the "save to file" box and name the file to automatically save the file as it is being acquired. Double check all parameters are set correctly and hit "start run". After acquisition is complete, to view the file in a three dimensional format, click on the volume threshold icon. Figure 2 demonstrates the ability to observe many cell divisions using a wide field view of an AB wild-type zebrafish tail. 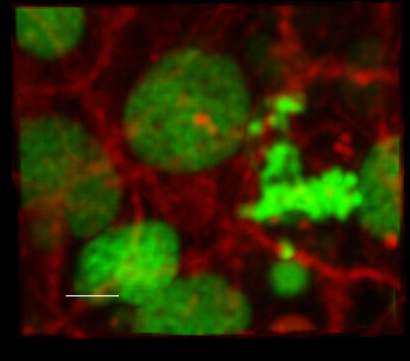 Over seven mitotic cells are imaged in a 14 min time frame (Movie 1). Within the two hr time-course, over 40 mitotic events were captured. On average, 50 dividing cells were observed in the AB and 30 dividing cells in aurBm/m embryos (Figure 2B). To account for the number of cells imaged, the ratio of mitotic cells to number of cells imaged was calculated (Figure 2C). This data suggest that there is not a lower number of cells going through mitosis in the aurBm/m embryos (Figure 2B) but fewer numbers of cells being imaged. The ability to acquire a statistically significant number of events such as this will aid in statistical power. Figure 3 expands on this technique to include quantifying mitotic duration. Once a time-lapse session is acquired, an individual cell can be analyzed for time spent in mitosis with adequate resolution by using the zoom tool (Figure 3A, B). Mitotic duration is calculated manually by counting how many time intervals take up one cell division. The number of time intervals is then multiplied by the interval of time between each Z-stack. For example, in Figure 3C, the division took up 12 time intervals and the interval of time between each Z-stack was 2 min. Therefore, the division time for this cell was 24 min. The average AB wild-type division time is 25 min and 58 min for aurBm/m (Figure 3B). A prolonged division time as seen in the aurBm/m suggests that the spindle assembly checkpoint has not been satisfied due to erroneous kinetochore attachments1,2. Taking a closer look at the zoomed in wild-type embryos, each mitotic phase can be distinguished (Figure 3C, Movie 2). In addition, mitotic defects can be observed in the aurBm/m embryo which include mitotic arrest and failed cytokinesis resulting in a binucleated cell and subsequent formation of a micronucleus (Figure 3D, Movie 3). This zoomed in analysis showing mitotic defects supports the increased division time acquired in Figure 3B. Various other diverse mitotic defects and cell fates that may be encountered are explored in Figure 4; demonstrated in the esco2+/m and esco2m/m embryos. In an esco2+/m embryo, erroneous chromosome movements are captured and can be defined as congression defects. Congression defects occur when improper microtubule attachments are made. These defects will cause failure of the chromosomes to migrate toward the metaphase plate. Paired sister chromatids, particularly identifiable at min 20 and 46, that have not congressed toward the metaphase plate can be first observed at min 14. Anaphase onset separates the sister chromatids aligned at the metaphase plate as well as the paired sister chromatids to the right, observed at minute 50. Additionally, possible micronucleus formation is observed as these separated sister chromatids remain isolated outside the nucleus (T= 50, Figure 4A, Movie 4). In Figure 4B, a multi-polar division is visualized (Movie 5). Multi-polar divisions often occur due to centrosome amplification, but may occur through other means42. In Figure 4C, an esco2m/m cell initially demonstrates premature sister chromatid separation and spindle rotation9,43,44. Another cell fate demonstrated in this panel is an anaphase bridge in which merotelic attachments are unresolved45,46. The anaphase bridge can be first seen at minute 62. The chromatin appears to prematurely decondense while the cell is undergoing cytokinesis. As cytokinesis occurs, the cleavage furrow impinges on the decondensed chromosomes and, as abscission occurs, pulls the chromatin material to form an anaphase bridge (Figure 4C, Movie 6). Though not shown here, in order to quantify the cellular fates, record all the mitotic divisions in each frame and the type of cell fate they exhibit. Divide the number of cells in each fate by the total number of divisions recorded and multiply by 100 to calculate the cell fate percentage. Figure 1: Protocol Drawings Outline. (A) Schematic drawing of the imaging technique progression beginning at H2A.F/Z-GFP and CAAX-mCherry mRNA injections, then onto embedding of embryos and procession to confocal microscopy. (B) Schematic drawing of the embryo embedding process. The injected embryos must be dechorionated and anesthetized. Embryos are then transferred to the coverslip-bottom dish and excess E3 Blue is removed. Low melt agar is used to create separate domes covering each embryo. Orient the embryos so the tail is closest to the coverslip. Wait two min before adding agar covering the whole coverslip. Wait until the agar is solidified before moving to image. (C) Schematic drawing to define the terms Z-interval, Z-stack, Z-depth, time interval, time duration and 5D that are used in the protocol and discussion. Z-interval is defined as the distance between each image as the microscope moves deeper into the sample to create a Z-stack. Z-stack is all of the images taken through a sample at the defined Z-interval. The distance traveled in a Z-stack defines the Z-depth. Time interval is the amount of time between one Z-stack and the next Z-stack to create a time-lapse image. Time duration is the total amount of time used to image. 5D is defined as the dimensions X, Y, Z, time, and fluorescent emission. Please click here to view a larger version of this figure. Figure 2. Time-Lapse Imaging Captures Multiple Mitotic Events in a Live Zebrafish Embryo. (A) Time-lapse stills from a zoomed out experiment in an AB wild-type, 24 hpf zebrafish showing multiple mitotic events. Asterisks point towards seven cells in mitosis. t = time elapsed in min. Scale bar = 5 µm. (B) The number of mitotic cells observed in AB and aurBm/m zebrafish tails at 24 hpf. Mean ± st. dev., n = 3 embryos/genotype. (C) The ratio of mitotic cells per total number of cells in AB and aurBm/m zebrafish tails at 24 hpf. Mean ± st. dev., n = 3 embryos/genotype. Please click here to view a larger version of this figure. Figure 3. Individual Cell Analysis Captures Each Mitotic Phase and Mitotic Duration. (A) A cell selected from the wide field view of AB wild-type, 24 hpf zebrafish embryo shown in Figure 2A. (B) Division time is observed for AB and aurBm/m cells and calculated from inferring nuclear envelope breakdown (NEB) at the first observation of condensed chromatin in a cell to formation of two new daughter cells. n = 3 embryos/genotype, n = 66 divisions for AB, n = 29 divisions for aurBm/m, ***p-value < 0.001. (C) AB wild-type cell is cropped to visualize the phase progression through mitosis. t = min. Scale bar = 5 µm. (D) aurBm/m cell is cropped to visualize mitotic progression through mitosis which includes mitotic arrest resulting in cytokinesis failure and micronuclei formation. Arrows point towards the micronuclei. t = time elapsed in min. Scale bar = 5 µm. Please click here to view a larger version of this figure. Figure 4. Single Cell Live Imaging Captures Multiple Mitotic Defects Associated with Chromosome Segregation and Division in Mitotic Mutant Zebrafish. (A) A cropped image of a cell undergoing congression defects in an esco2+/m embryo. The thin arrow monitors the left chromosome that is pulled back into the metaphase plate. The thick arrow monitors the right chromosome that is not pulled back into the metaphase plate and inferred to form a micronucleus. The double arrow shows the separation of the right chromosome that did not congress at anaphase onset. Insets show zoomed in views of the chromosomes that failed to congress. Insets were cropped and brightness enhanced for better visualization. CAAX fluorescence was removed to visualize the chromosomes more easily. Scale bar = 5 µm. 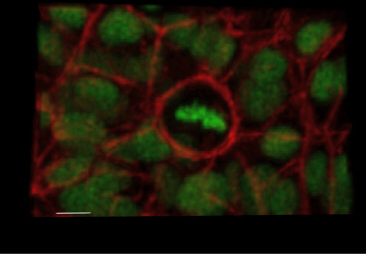 (B) A cropped image of a cell undergoing mitotic arrest that results in a multi-polar division in an esco2+/m embryo. Scale bar = 5 µm. 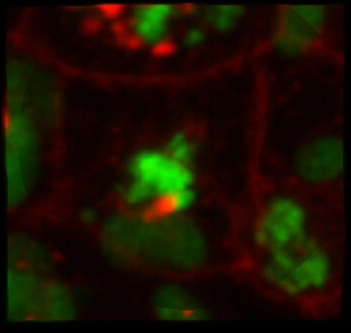 (C) A cropped image of a cell undergoing cohesion fatigue resulting in anaphase bridge formation seen by the thread-like pulling between the two nuclei noted by the brackets. Scale bar = 5 µm. t = time elapsed in min. Please click here to view a larger version of this figure. Movie 1. Multiple cell divisions can be visualized in a wide view of an injected wild-type zebrafish embryo (right click to download). Movie 2. Phases of mitosis can easily be visualized in a wild-type zebrafish embryo (right click to download). Nuclear envelope breakdown is inferred by the irregular appearance of the nucleus and proceeds towards congression of the sister chromatids to form a metaphase plate. Accurate segregation occurs and yields two new daughter cells. Movie 3. Live imaging of aurBm/m embryo reveals chromosome missegregation, failed cytokinesis, and micronuclei formation (right click to download). Nuclear envelope breakdown is inferred by the irregular appearance of the nucleus, chromosomes scatter to opposite poles unable to form a proper metaphase plate, and proceed to rotate on axis extending the division time of the cell. Cytokinesis does not occur resulting in a 4N cell and multiple micronuclei. Movie 4. Congression defects are observed in an esco2+/m embryo (right click to download). Nuclear envelope breakdown is inferred by the irregular appearance of the nucleus. After the metaphase plate is formed, a few individual chromosomes scatter to either side. One individual chromosome off to the left is eventually pulled back into the metaphase plate while the chromosome to the right remains outside of the metaphase plate and can be seen separating sister chromatids at the onset of anaphase. The cell exhibits a prolonged division time but ultimate divides with potential micronucleus formation. Movie 5. Multi-polar division is observed in an esco2+/m embryo (right click to download). Nuclear envelope breakdown is inferred by the irregular appearance of the nucleus and then chromosomes merge to form a Y-shape indicative of 3-spindle poles. The cell exhibits a prolonged division time but ultimately divides into 3 daughter cells. Movie 6. Premature sister chromatid separation and anaphase bridge formation are observed in an esco2m/m embryo (right click to download). Nuclear envelope breakdown is inferred by the irregular appearance of the nucleus and then chromosomes scatter throughout the cell unable to form a proper metaphase plate. The chromatin decondenses prior to cytokinesis and as the cell divides, creates an anaphase bridge between the two cells. Use of this method allows one to infer nuclear envelope breakdown, formation of a metaphase plate by microtubule-kinetochore attachments, and segregation of sister chromatids to form two new cells in vivo and in a time-dependent manner. The ability to observe mitosis in zebrafish is advantageous over fixed samples and cell culture systems because the cells are being imaged in the natural physiology, the tissue is transparent which allows for fluorescent proteins to be used, they develop relatively fast, and time-lapse imaging can be acquired. Use of adult zebrafish for this protocol is restricted due to the limited Z-depth that can be acquired due to the thicker tissue that is not the skin or eyes. While transgenic animals expressing H2A.F/Z-EGFP and mCherry-CAAX could be used for the same purpose, the versatility and ease of the mRNA injections into different mutant zebrafish is advantageous over genetic crosses. In situations where mitotic analysis is required in three days post fertilization (dpf) or later embryos, transgenic animals would be necessary due to the half-life of RNA in this rapidly developing organism. Other fluorescent proteins for visualizing mitosis are amenable to this protocol. For example, H2B-GFP mRNA is an alternative to H2A.F/Z-EGFP for chromatin, and provides similar labeling. 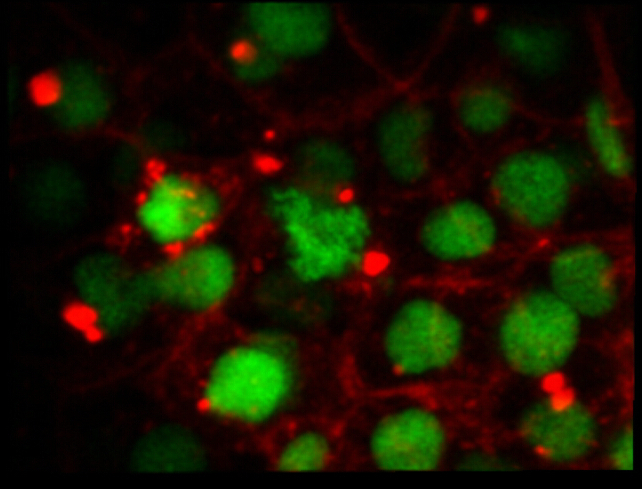 Other fluorescent-tagged proteins that can be used in this technique include POM121, centrin, Eb1, Hec1, and EMTB which would allow for live in-embryo imaging of the nuclear envelope, centrioles, plus-end microtubules, kinetochore, and microtubules, respectively32,47-51. This protocol has several key imaging steps that must be executed to achieve quality results: 1) Make sure to optimize the mRNA quality and concentration to yield the brightest fluorescence and no toxicity as possible. The more fluorescence will lead to less laser exposure and therefore, less photobleaching and phototoxicity. 2) The embryo must be fully anesthetized and secure in the agar. Minor movements will alter results and could ruin the experiment. 3) The agar concentration must be appropriate for the stage of embryo desired to be imaged. At 24 hpf and further, 1% low-melt agarose is suitable. If imaging at 12 hpf or earlier, a 0.3% agarose solution should be used39. 4) The ROI in the embryo should be as close to the coverslip as possible. This step does not limit one to imaging the tail. The eyes, skin, dorsal region, yolk, and fin fold are examples of other areas that can use this protocol. Time is the defining factor that separates this protocol from imaging fixed embryos or tissues. When setting up the Z-stack, Z-interval, time-lapse interval, and time-lapse duration, it is important to keep in mind the context of the experiment (Figure 1C). A wild-type cell division usually lasts approximately 25 min at 24 hpf. In this instance, a 2 µm Z-interval covering 40 µm of tissue in a Z-stack, with a two minute time interval for two hr has proven effective. Further, in embryos with defective mitosis, cells in a mitotic arrest will most likely be present, drastically increasing cell division times. To acquire multiple full divisions, the time duration should be increased, i.e., from 2 hr to 4 hr. A longer acquisition time will expose the sample to more laser power and increase the risk of photobleaching and phototoxicity. In this case, the time interval between each Z-stack should be increased. Dynamic chromosome movements will be sacrificed by increasing the time interval between Z-stacks, but time duration is gained. This is necessary when imaging cell divisions that may last over two hr. Though it was not directly discussed, this protocol can be optimized to obtain a higher resolution image in the Z-plane to more accurately visualize individual chromosome movements. For example, in Figure 4A two missegregated chromosomes are observed. The chromosome to the right (noted by the thick arrow) is initially bright and in focus but dims in the last few frames. With a 2 µm Z-interval, the uncongressed chromosome falls in between the Z-interval. Capturing minute movements and singular chromosome events can be accomplished by increasing the resolution in the Z plane. To do this, zoom in on an individual cell using the A1 Scan Area tool. When setting up the Z-stack parameters, use a smaller Z-interval distance. A recommended range is 0.5 - 1 µm. In addition, decreasing the time interval between each Z stack will create smoother transitions between each time frame, i.e., from two min to 30 sec - 1 min. One caveat to this type of imaging is the limited Z-depth that can be attained. Due to the smaller Z-interval and time interval, more tissue will be exposed to the lasers in a smaller time frame. To overcome this, smaller time duration can be used; however this is also dependent on how long the researcher would like to capture divisions. An analogy that may help with these modifications is to think of a Z-stack as an accordion. The distance between each pleat of the bellows is the Z-interval and the Z-depth is represented by the length of the accordion. In an instance where one would not want to accrue any more laser exposure to the sample, as the accordion stretches (increases Z-depth), the distance between the pleats of the bellows (Z-interval) must increase as well. The inverse is true in that as the accordion contracts, the Z-depth decreases. The pleats of the bellows contract as well, corresponding to a decrease in Z-interval. This analogy can be applied to fixed and live samples. The complexity is increased in this protocol when time is added to the equation. There is a finite amount of time that the accordionist can extend or contract the accordion. This represents the time interval. In order to cover more distance (Z-depth) the time interval must increase. As well, in order to hear more music, one must listen for a longer amount of time (time duration) In terms of this protocol, in order to witness more cell divisions, the time duration must increase. A compounding factor to keep in mind is that the more music that is played, the more tired the accordionist. This is analogous to the final dimension, fluorescence. The more laser exposure the sample is given, the more photobleaching and phototoxicity (tiredness) becomes an issue. In summary, this protocol details a method to visualize mitosis in a live zebrafish embryo applicable to different analyses; 1) division number 2) division time 3) division fate and 4) high resolution chromatin dynamics. Multiple possibilities for visualizing mitotic components ranging from microtubule-kinetochore attachments to centriole dynamics can be applied. Combining the capability of imaging mitosis in vivo with the recent advances in genome editing in zebrafish will make it easy to generate mutants in various aspects of mitosis to model human disease in a vertebrate organism25,26,52-56. We thank Kristen Kwan for the pCS2-H2A.F/Z-EGFP and pCS2-mCherry-CAAX vectors. We thank Chris Rodesch for tutoring us in live imaging in zebrafish. We thank Shawn Williams, Erik Malarkey and Brad Yoder for assistance in confocal imaging at UAB and the High Resolution Imaging Facility at UAB. The High Resolution Imaging Facility is supported by the UAB Comprehensive Cancer Center Support Grant (P30CA013148) and the Rheumatic Disease Core Center (P30 AR048311). J.M.P. is supported by the National Institute of Neurological Disease and Stroke (NIH R21 NS092105), and pilot grants from American Cancer Society (ACS IRG-60-001-53-IRG) and the UAB Comprehensive Cancer Center (P30CA013148). S.M.P. is supported by the Cell and Molecular Biology T32 Training Grant (5T32GM008111-28). Musacchio, A., Hardwick, K. G. The spindle checkpoint: structural insights into dynamic signalling. Nat Rev Mol Cell Biol. 3, (10), 731-741 (2002). Li, X., Nicklas, R. B. Mitotic forces control a cell-cycle checkpoint. Nature. 373, (6515), 630-632 (1995). Rieder, C. L., Cole, R. W., Khodjakov, A., Sluder, G. The checkpoint delaying anaphase in response to chromosome monoorientation is mediated by an inhibitory signal produced by unattached kinetochores. J Cell Biol. 130, (4), 941-948 (1995). Hayles, J., Nurse, P. A review of mitosis in the fission yeast Schizosaccharomyces pombe. Exp Cell Res. 184, (2), 273-286 (1989). Pederson, T. Historical review: an energy reservoir for mitosis, and its productive wake. Trends Biochem Sci. 28, (3), 125-129 (2003). Sobel, S. G. Mini review: mitosis and the spindle pole body in Saccharomyces cerevisiae. J Exp Zool. 277, (2), 120-138 (1997). Thompson, S. L., Compton, D. A. Chromosome missegregation in human cells arises through specific types of kinetochore-microtubule attachment errors. Proc Natl Acad Sci U S A. 108, (44), 17974-17978 (2011). Duijf, P. H., Benezra, R. The cancer biology of whole-chromosome instability. Oncogene. 32, (40), 4727-4736 (2013). Lara-Gonzalez, P., Taylor, S. S. Cohesion fatigue explains why pharmacological inhibition of the APC/C induces a spindle checkpoint-dependent mitotic arrest. PLoS One. 7, (11), 49041 (2012). Araujo, A., Baum, B., Bentley, P. The role of chromosome missegregation in cancer development: a theoretical approach using agent-based modelling. PLoS One. 8, (8), 72206 (2013). Deardorff, M. A., et al. HDAC8 mutations in Cornelia de Lange syndrome affect the cohesin acetylation cycle. Nature. 489, (7415), 313-317 (2012). Chetaille, P., et al. Mutations in SGOL1 cause a novel cohesinopathy affecting heart and gut rhythm. Nat Genet. 46, (11), 1245-1249 (2014). Kaiser, F. J., et al. Loss-of-function HDAC8 mutations cause a phenotypic spectrum of Cornelia de Lange syndrome-like features, ocular hypertelorism, large fontanelle and X-linked inheritance. Hum Mol Genet. 23, (11), 2888-2900 (2014). Snape, K., et al. Mutations in CEP57 cause mosaic variegated aneuploidy syndrome. Nat Genet. 43, (6), 527-529 (2011). Suijkerbuijk, S. J., et al. Molecular causes for BUBR1 dysfunction in the human cancer predisposition syndrome mosaic variegated aneuploidy. Cancer Res. 70, (12), 4891-4900 (2010). Vega, H., et al. Roberts syndrome is caused by mutations in ESCO2, a human homolog of yeast ECO1 that is essential for the establishment of sister chromatid cohesion. Nat Genet. 37, (5), 468-470 (2005). Andrews, P. D., Harper, I. S., Swedlow, J. R. To 5D and beyond: quantitative fluorescence microscopy in the postgenomic era. Traffic. 3, (1), 29-36 (2002). 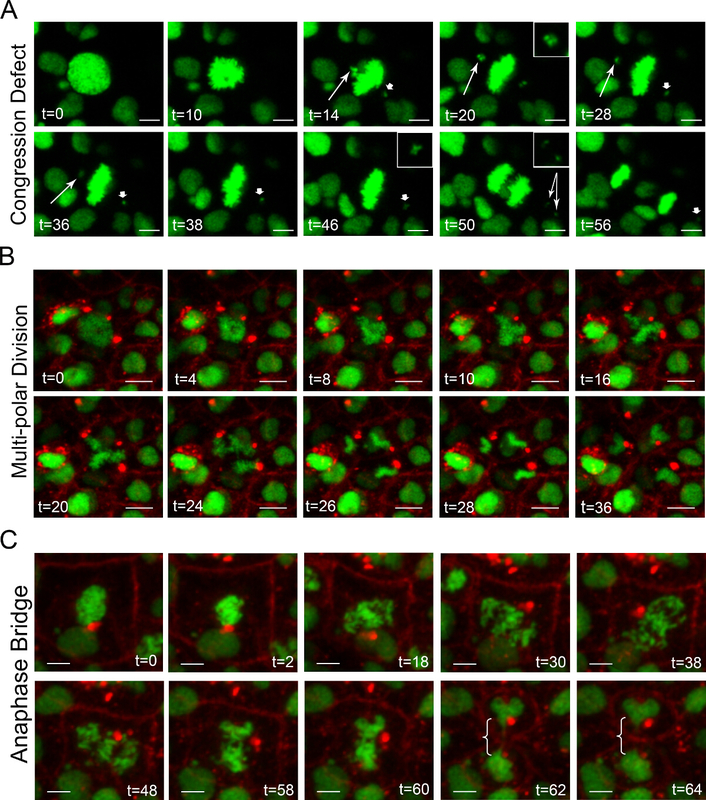 Nigg, E. A. Mitotic kinases as regulators of cell division and its checkpoints. Nat Rev Mol Cell Biol. 2, (1), 21-32 (2001). Carlton, J. G., Caballe, A., Agromayor, M., Kloc, M., Martin-Serrano, J. ESCRT-III governs the Aurora B-mediated abscission checkpoint through CHMP4C. Science. 336, (6078), 220-225 (2012). Yabe, T., et al. The maternal-effect gene cellular island encodes aurora B kinase and is essential for furrow formation in the early zebrafish embryo. PLoS Genet. 5, (6), 1000518 (2009). Hou, F., Zou, H. Two human orthologues of Eco1/Ctf7 acetyltransferases are both required for proper sister-chromatid cohesion. Mol Biol Cell. 16, (8), 3908-3918 (2005). Ivanov, D., et al. Eco1 is a novel acetyltransferase that can acetylate proteins involved in cohesion. Curr Biol. 12, (4), 323-328 (2002). Beckouet, F., et al. An Smc3 acetylation cycle is essential for establishment of sister chromatid cohesion. Mol Cell. 39, (5), 689-699 (2010). Monnich, M., Kuriger, Z., Print, C. G., Horsfield, J. A. A zebrafish model of Roberts syndrome reveals that Esco2 depletion interferes with development by disrupting the cell cycle. PLoS One. 6, (5), 20051 (2011). Percival, S. M., et al. Variations in dysfunction of sister chromatid cohesion in esco2 mutant zebrafish reflect the phenotypic diversity of Roberts syndrome. Dis Model Mech. 8, (8), 941-955 (2015). Amsterdam, A., Hopkins, N. Retroviral-mediated insertional mutagenesis in zebrafish. Methods Cell Biol. 77, 3-20 (2004). Amsterdam, A., et al. Identification of 315 genes essential for early zebrafish development. Proc Natl Acad Sci U S A. 101, (35), 12792-12797 (2004). Jeon, H. Y., Lee, H. Depletion of Aurora-A in zebrafish causes growth retardation due to mitotic delay and p53-dependent cell death. FEBS J. 280, (6), 1518-1530 (2013). Jeong, K., Jeong, J. Y., Lee, H. O., Choi, E., Lee, H. Inhibition of Plk1 induces mitotic infidelity and embryonic growth defects in developing zebrafish embryos. Dev Biol. 345, (1), 34-48 (2010). Bonenfant, D., Coulot, M., Towbin, H., Schindler, P., van Oostrum, J. Characterization of histone H2A and H2B variants and their post-translational modifications by mass spectrometry. Mol Cell Proteomics. 5, (3), 541-552 (2006). Kwan, K. M., et al. A complex choreography of cell movements shapes the vertebrate eye. Development. 139, (2), 359-372 (2012). Pilaz, L. J., Silver, D. L. Live imaging of mitosis in the developing mouse embryonic cortex. J Vis Exp. (88), (2014). Davidson, G., et al. Casein kinase 1 gamma couples Wnt receptor activation to cytoplasmic signal transduction. Nature. 438, (7069), 867-872 (2005). Smith, R. M., et al. Exocytotic insertion of calcium channels constrains compensatory endocytosis to sites of exocytosis. J Cell Biol. 148, (4), 755-767 (2000). Reid, T. S., Terry, K. L., Casey, P. J., Beese, L. S. Crystallographic analysis of CaaX prenyltransferases complexed with substrates defines rules of protein substrate selectivity. J Mol Biol. 343, (2), 417-433 (2004). Gerlach, G. F., Morales, E. E., Wingert, R. A. Microbead Implantation in the Zebrafish Embryo. J Vis Exp. (101), e52943 (2015). Porazinski, S. R., Wang, H., Furutani-Seiki, M. Microinjection of medaka embryos for use as a model genetic organism. J Vis Exp. (46), (2010). Rosen, J. N., Sweeney, M. F., Mably, J. D. Microinjection of zebrafish embryos to analyze gene function. J Vis Exp. (25), (2009). Sugiyama, M., et al. Illuminating cell-cycle progression in the developing zebrafish embryo. Proc Natl Acad Sci U S A. 106, (49), 20812-20817 (2009). 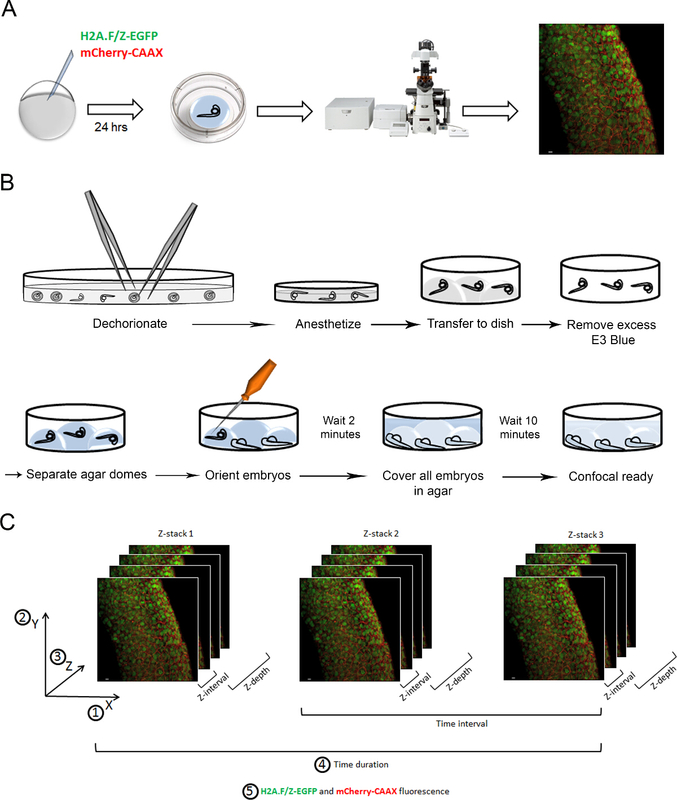 Ariga, J., Walker, S. L., Mumm, J. S. Multicolor time-lapse imaging of transgenic zebrafish: visualizing retinal stem cells activated by targeted neuronal cell ablation. J Vis Exp. (43), (2010). O'Brien, G. S., et al. Two-photon axotomy and time-lapse confocal imaging in live zebrafish embryos. J Vis Exp. (24), (2009). Maiato, H., Logarinho, E. Mitotic spindle multipolarity without centrosome amplification. Nat Cell Biol. 16, (5), 386-394 (2014). Gorbsky, G. J. Cohesion fatigue. Curr Biol. 23, (22), 986-988 (2013). Daum, J. R., et al. Cohesion fatigue induces chromatid separation in cells delayed at metaphase. Curr Biol. 21, (12), 1018-1024 (2011). Germann, S. M., et al. TopBP1/Dpb11 binds DNA anaphase bridges to prevent genome instability. J Cell Biol. 204, (1), 45-59 (2014). Chan, K. L., North, P. S., Hickson, I. D. BLM is required for faithful chromosome segregation and its localization defines a class of ultrafine anaphase bridges. EMBO J. 26, (14), 3397-3409 (2007). Wuhr, M., Obholzer, N. D., Megason, S. G., Detrich, H. W., Mitchison 3rd,, J, T. Live imaging of the cytoskeleton in early cleavage-stage zebrafish embryos. Methods Cell Biol. 101, 1-18 (2011). 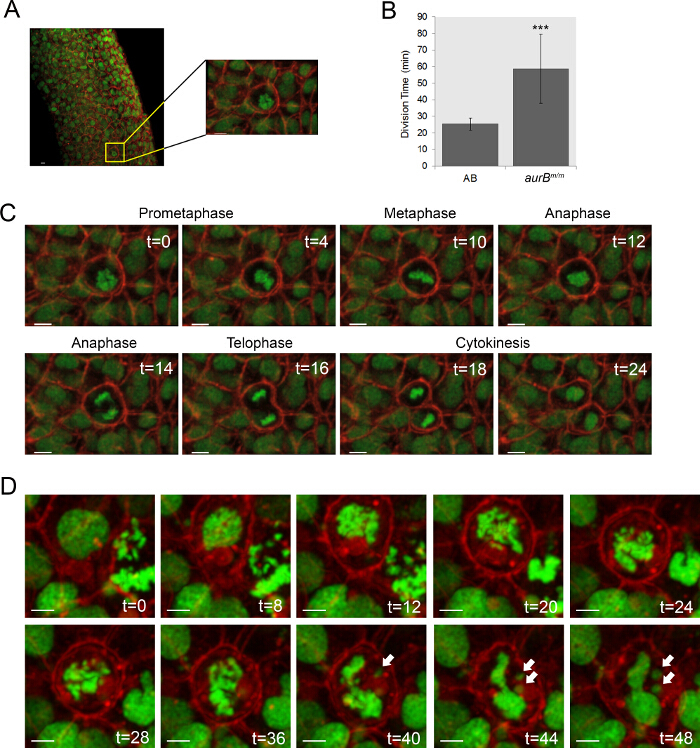 Gascoigne, K. E., Cheeseman, I. M. CDK-dependent phosphorylation and nuclear exclusion coordinately control kinetochore assembly state. J Cell Biol. 201, (1), 23-32 (2013). Scott, E. S., O'Hare, P. Fate of the inner nuclear membrane protein lamin B receptor and nuclear lamins in herpes simplex virus type 1 infection. J Virol. 75, (18), 8818-8830 (2001). Shankaran, S. S., Mackay, D. R., Ullman, K. S. A time-lapse imaging assay to study nuclear envelope breakdown. Methods Mol Biol. 931, 111-122 (2013). Jao, L. E., Wente, S. R., Chen, W. Efficient multiplex biallelic zebrafish genome editing using a CRISPR nuclease system. Proc Natl Acad Sci U S A. 110, (34), 13904-13909 (2013). Irion, U., Krauss, J., Nusslein-Volhard, C. Precise and efficient genome editing in zebrafish using the CRISPR/Cas9 system. Development. 141, (24), 4827-4830 (2014). Hwang, W. Y., et al. Efficient genome editing in zebrafish using a CRISPR-Cas system. Nat Biotechnol. 31, (3), 227-229 (2013). Hruscha, A., et al. Efficient CRISPR/Cas9 genome editing with low off-target effects in zebrafish. Development. 140, (24), 4982-4987 (2013). Thomas, H. R., Percival, S. M., Yoder, B. K., Parant, J. M. High-throughput genome editing and phenotyping facilitated by high resolution melting curve analysis. PLoS One. 9, (12), 114632 (2014).